Le You Pet Semi-Automatic Cat Litter Box Review - Cute, but Functional? 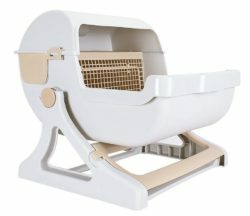 Le You Pet semi-automatic litter box is a unique innovation from regular litter boxes. 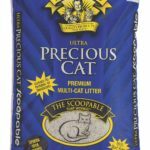 Its design is cool and practical, making it much easier to clean the cat litter box without bending over too much or squatting. This functional design features a swinging bottom bucket with sifting grid and a waste drawer for easy collection of litter clumps. With Le You Pet you won’t have to scoop, only turn-on the base of the litter box, screen the clean litter and pull out the waste drawer to empty it. This way your cat will enjoy a much cleaner box. 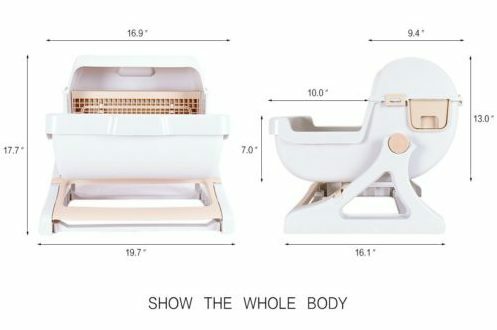 Le You Pet semi-automatic litter box is made from a non-toxic eco-friendly polypropylene material that doesn’t have a strong chemical smell like other plastics. The material of this unit is resistant to moisture, to acid an alkali corrosion and is anti-soluble, this way it won’t get corroded by the cat urine. The litter box comes in several parts that need to be assembled according to the included instructions. The waste drawer and screen get connected to the roof by secure plastic tabs. Once you assemble the litter box the structure is stable and it seems durable. Le You Pet features a very simple mechanism to collect the litter clumps. 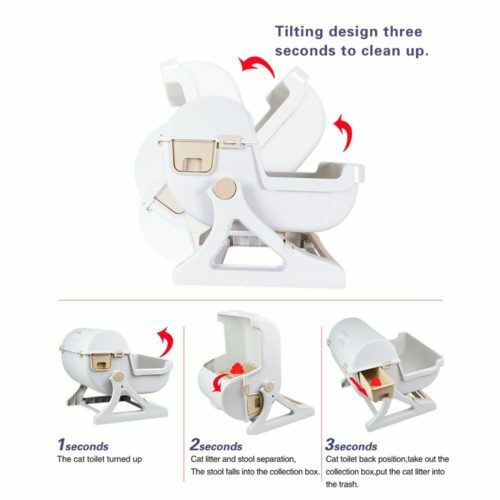 It consists of a stand and a bucket connected to a rotational tab that allows the litter box to swing up to a little over 90 degrees. The bucket or litter box features a screen inside that sifts the dirty litter and it has a waste drawer right next to it where the clumps drop. All you need to do to clean the litter box is turn the upper part over and you will be able to sift the litter from the clumps to make them drop into the waste drawer and return the bucket back into position, the litter box is clean again for another use. To empty the litter box simply pull out the drawer and dump the clumps into a bag for later disposal. The cat needs to jump into the litter box, about 9-10 inches to do its business. The litter area measures 15.5” Wide x 12.8” Large x 5” deep which is enough room for an average cat to use it without problems unless you have a cat that sprays high. The front of the litter bucket is a little higher than the sides which helps to reduce litter spillage. The cat needs to jump high to access the litter box, most cats can do it, but isn’t suitable for disable or elderly cats. If your cat doesn’t want to jump into the litter box you can use a ramp to help him. Use a good clumping litter with the best odor control since the clumps will be sitting in the waste drawer until you empty it. Keep a good amount of litter in the litter box, too much will make it hard to tip. You need to slowly turn the base over to properly sift the litter. If you do it too fast you might get clean litter falls into the waste drawer. As the waste drawer doesn’t have a plastic liner, you can use the Litter Genie which is an excellent complement and help to dispose of the waste. If you are not handy assembling things or with tools you might need someone else to help you. Let You Pet is an innovative solution for cat owners that don’t like to scoop the litter box. This unit uses a similar mechanism of the Omega Paw or the Litter Spinner semi-automatic litter box but unlike those systems the Let You Pet litter box features an open litter area, covering only the waste drawer. This is a hygienic and better design since the other roll-over systems that feature a plastic globe make the roof of the globe smelly overtime and this doesn’t happen with the Let You Pet. Also, when a cat does its business in an enclosed litter box the odors elevates up to the roof and the plastic absorbs the ammonia overtime, creating a bad smell that is really hard to eliminate. The other great advantage of this unit over the other roll-over systems is that the bottom of the Le You Pet is seamless so it won’t leak urine, though the walls are not high enough to contain high sprayer cats.